Virginia Board of Physical Therapy 7.5 (Type 1) –-Please check with your state board for approval as most physical therapy boards will reciprocate approval for continuing education. The American Academy of Health and Fitness (BOC AP#: P3645) is approved by the Board of Certification, Inc. to provide continuing education to Certified Athletic Trainers. This program is eligible for a maximum of 7.50 Category A hours/CEUs. The Janda System of Evaluation and Treatment of Muscle Imbalance™ continuing education home study course presents postural techniques, neurology, and functional capabilities applied to alleviate chronic musculoskeletal pain and promote greater functionality. Developed by Vladimir Janda, in contrast to a more traditional structural view; the Janda approach is functional, emphasizing the importance of the sensorimotor system in controlling movement and chronic musculoskeletal pain syndromes from sports, occupational activities and daily living. This course offers practical, evidence-based application of Janda’s theories; with illustrations, photos, and step-by-step instructions; guiding exercise professionals in developing appropriate exercise prescription and training programs. The Janda System of Evaluation and Treatment of Muscle Imbalance™ continuing education home study course is offered to you in a distance-learning format, providing evidence-based explanation of muscle imbalance. The step-by-step Janda system of evaluation is explained; including analysis of posture, balance, and gait; evaluation of movement patterns; and testing of muscle length; and assessment of the soft tissue. Treatment options for muscle imbalance through facilitation and inhibition techniques and sensorimotor training to restore neuromsucular function are addressed. Four case studies examining musculoskeletal conditions and showing how the Janda approach compares with other treatments are included. 1. Distinguish between the structural and functional approaches to muscle imbalance. 2. Explain the structure and function of the sensorimotor system. 3. Identify the articular, muscular, and fascial chains and their role in functional movement. 4. Explain the pathology of musculoskeletal pain, weakness, and imbalance. 5. Describe the processes used for the functional evaluation and analyses of posture, balance, and gait. 6. Identify Janda’s six basic movement patterns and corresponding evaluation tests. 7. Explain the purpose and technique used for muscle length testing. 8. Explain the purpose and process of soft-tissue assessment and the characteristics of trigger points. 9. Discuss why peripheral structures are treated and techniques for bringing about peripheral changes. 10. Identify factors leading to muscle weakness and the recommended Janda treatments. 11. Describe sensorimotor training and its role in Janda’s treatment. 12. Discuss the pathology, assessment, and recommended treatment for cervical pain syndromes. 13. Discuss the pathology, assessment, and recommended treatment for upper-extremity pain syndromes. 14. Discuss the pathology, assessment, and recommended treatment for lumbar pain syndromes. 15. Discuss the pathology, assessment, and recommended treatment for lower-extremity pain syndromes. 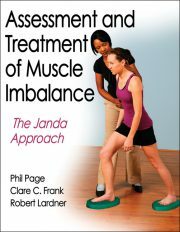 Electronic Format – The Janda System of Evaluation and Treatment of Muscle Imbalance™ certificate package with online test includes the eBook version of the 312-page Assessment and Treatment of Muscle Imbalance by Phillip Page, Clare Frank and Robert Lardner (accessed through Adobe Air with instructions for downloading Adobe Air) and a 112-page workbook provided in PDF format. Instructions for completing the multiple-choice online test and obtaining CECs are also included in PDF format. Note: This course package is made available for immediate access and download after purchase. All materials for this electronic format course are available electronically.